Plans and providers are under pressure to deliver higher quality and more cost-effective whole health care for the most vulnerable and complex members. Let us help. We can help solve burdensome processes, fragment care teams and disparate data silos that get in the way of delivering integrated whole-person care while managing new value-based requirements and solving for behavioral health and social factors. "Our providers are now able to share care plans between medical and behavioral health to ensure we are treating the whole health of the patient. HealthBI has helped us improve HEDIS outcomes and close 32% more gaps very quickly." Our country spends $33 billion dollars annually on avoidable hospital admissions as a result of poor care coordination and care transitions management – an effective solution is overdue. CareEmpower is a feature-rich solution like no other care navigation system you have used. Whether your organization’s goal is to quickly accelerate your Medicare Advantage program or to deploy a robust population health program for any of your at-risk populations, CareEmpower has what you need. Our solutions don’t just identify care opportunities, they completely change the process and speed of closing. What used to take months now takes a few days. It is estimated that 50% of readmission patients did not see a physician for follow up care prior to going back into the hospital. We want to help fix this. With HealthBI’s CareEmpower operating system, care teams can discover and act on opportunities together in a single virtual setting. Our streamlined Transitions Management module is made specifically for high-performing healthcare providers and payers. Now, you can proactively monitor and engage population groups with complex medical, behavioral, and long-term care needs and help them navigate through multiple care settings. It’s a formula that works, and the proof is in the results. HealthBI’s clients see an average of 33% increased PCP follow up visits. More than 20% of previously reported conditions drop off members’ records making the management of risk factors an expensive and time-consuming manual task for both providers and payers. HealthBI’s CareEmpower operating system ensures optimal reimbursement for complex members by simplifying provider engagement through automated workflows. Our streamlined workflow screens alert providers of potential coding issues. The system also offers a fast click-through process to attest and submit the required approval and evidences. Are your providers equipped with a complete view of their patients’ medication record? Do your care teams get automatic alerts for medication lapses, contradictions or misuse? Will your practice teams have the tools they need to meet the new HEDIS outcomes measures for med adherence? With CareEmpower, providers are given the timely insight they need to reconcile, review and modify a patient’s therapy that can reduce cost and ensure quality outcome measures are met. In a connected community of care, providers and health plans know when their patients are admitted and discharged from the hospital and ED. Quickly notifying and mobilizing your care team will reduce hospital readmission and avert millions of dollars of spending on preventable hospitalizations. HealthBI’s Event Notification System (ENS) connects, alerts and updates healthcare providers and payers of patients ADT events and outcomes and allows secured messaging for care team collaborative planning. One of the biggest challenges providers face with performance based reimbursements, is knowing where they stand on their performance goals from day to day. Managing patient activities according to reports that are two months out of date wastes resources and causes payer provider mistrust and mis alignment. HealthBI tackled this issue head-on. 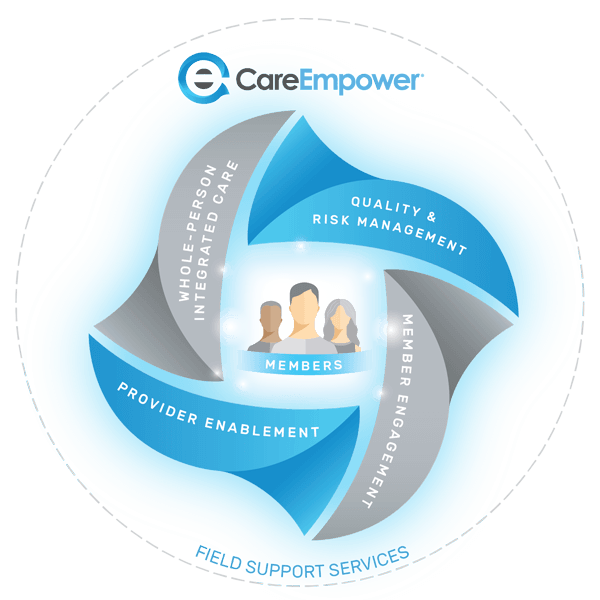 CareEmpower gives payers and providers the ability to closely manage performance activities and outcomes as never before – improving collaboration, trust and and patient health. With reliable information always available, at last care teams can act in time to make a meaningful difference. To achieve better outcomes and cost savings, payers and providers need to make care more convenient, more accessible, and more affordable for the members they serve. Allowing members the ability to access convenient, personalized healthcare and resources based on their location, health access data, cultural preferences, financial and transportation constraints will quickly drive success for your member engagement initiatives. Real value-based care. Real outcomes.